Our half-day glassblowing course for beginners is an exciting and intensive experience aimed at introducing novices to the wonders of hot glass. The course is for adults over the age of 18 and no experience is necessary as you will be guided every step of the way. Half-day introductory courses cost £195 per person (including VAT). All courses are taught at Adam’s spacious and light studio in West Horsley, Surrey. West Horsley is about 10 minutes east of Guildford and less than an hour by car or train from London. An Introduction to Glassblowing: Half-day course for beginners, run on most Saturdays and Sundays throughout the year. Use the button on this page to check available course dates and make your online booking. 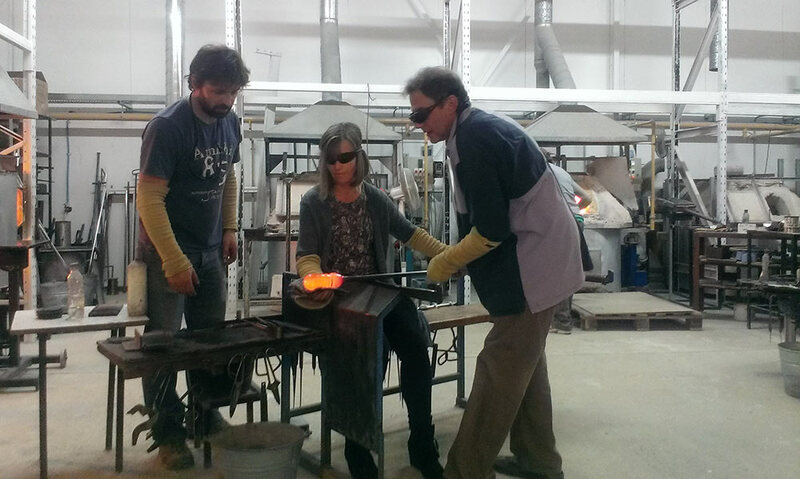 Our half-day course is an exciting and intensive experience aimed at introducing beginners to the wonders of hot glass. No experience is necessary as you will be guided every step of the way. Half-day introductory courses cost £195 per person (including VAT). The course is aimed at adults over the age of 18. However, teaching can be arranged for children and young people from 11-18. Please contact Adam for details. The course is limited to four pupils so that Adam and his assistant Will can give you plenty of individual attention, ensuring impressive results for first timers! – Blowing a glass vessel. You will be able to choose your shapes and colours and by the end of the lesson, we expect you to have made several pieces, usually including a paperweight, a small sculpture and a blown vessel, which will be yours to keep and treasure! Each class is three hours long – either on a Saturday or Sunday morning or Saturday or Sunday afternoon. The morning course starts at 9.45am and the afternoon course starts at 1.45pm. If you would like to come by train, rather than driving, we can arrange to pick you up at the station for the short drive to the studio and drop you off afterwards. Please request this option by email after your online booking is confirmed. All safety equipment and materials are provided. Please dress appropriately for a workshop environment. We recommend sturdy flat enclosed shoes (trainers are ideal), jeans or long trousers and a long-sleeved T-shirt or shirt. Natural fibres are best for a hot environment. Please tie back long hair and remove jewellery that might get caught on equipment. As hot glass needs to be annealed overnight to cool down gradually, and then needs to be cold worked to finish, your work will not be available to take away with you on the day! You can either arrange to return to collect your coursework, or we can pack and post it to you for £15 P&P for one person, or £20 for two people taking a course together. If collecting, your work will usually be available for collection on or after the Thursday following your weekend course. Confirmation: You will receive an email confirmation of your online booking. Pre-course/event information will usually be sent by email in advance including information on anything that you may need to bring. Cancellations: For cancellations made four weeks or more in advance of the course date, we offer a 70% refund or one free date change. For cancellations made between two and four weeks in advance of the date, we offer a 50% refund or one date change with a £50 administration fee. If we receive less than two weeks’ notice, we are unable to offer a refund or date change. If a date change has been requested and confirmed, we cannot offer any further refunds or date changes on a subsequent cancellation for the same booking. Coursework/materials: Courses are inclusive of all basic materials and safety equipment. All items produced on the course by students are theirs to keep. See delivery section below. Delivery of coursework: Owing to the annealing processes involved with hot glassmaking, coursework cannot be taken home at the end of the day. Work is available to be collected, usually on or after the Friday following a weekend course. Alternatively, we can package and ship work to a UK mainland address for a fee of £15 for one person, or £20 for two people taking the course together. We can also quote for shipping overseas if required. Class Size: Class sizes are a maximum of four people, allowing for an intensive learning experience and plenty of individual attention. Safety Briefing: All courses begin with a detailed safety briefing and all students are asked to sign a form confirming they have listened to, and understood, the briefing. Postponement: Adam Aaronson Glass Studio reserves the right to postpone, or cancel the date of courses should it become necessary and for whatever reason. Students will be notified as soon as possible and alternative dates will be arranged or a full refund given. 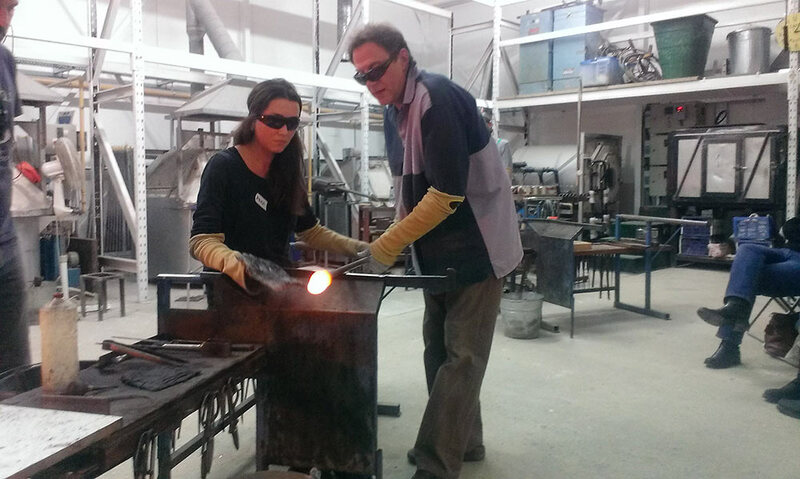 Course Admission: Adam Aaronson Glass Studio reserves the right to refuse to admit any person who in our opinion is not in a condition to safely undertake the course. We also reserve the right to terminate a course, or exclude an individual, for any improper or unacceptable behaviour. Should this be the case, no fees will be refunded. Photography: We reserve the right to use on our website, or for publicity purposes, any photographs we might take during a course, including those of course participants. Students may take photographs during the course where safety permits. Send us a message, call 01483 375035 or email for further information.